Kelly Knodel, a contractor from Freeman, removes an abandoned underground fuel tank from Vermillion’s old electric plant with ease Tuesday afternoon with the help of a giant-sized backhoe. Knodel was kept busy in Clay County all week, digging up buried tanks as part of the South Dakota Spruce Up Program. Citizens of Vermillion can thank the South Dakota Legislature and the Spruce Up South Dakota Program for Kelly Knodel’s presence in the city this week. 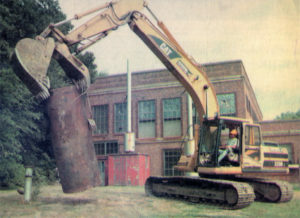 The 2000 Legislature passed SB 197, which authorized a voluntary abandoned underground tank removal project. The project, which originated in Gov. William Janklow’s office, authorizes the Department of Environment and Natural Resources (DENR) to remove tanks that qualify and the Petroleum Release Compensation Fund (PRCF) to pay for the removal and any necessary environmental cleanup. A state-authorized tank removal was held about 12 years ago, but many still remained buried. Janklow and other state officials worried about water contamination should fuel leak from the old tanks. Abandoned petroleum and waste oil tanks located at gas stations or commercially operational motor fuel vendors that closed before April 1, 1988. Abandoned petroleum and waste oil tanks located at gas stations or commercially operational motor fuel vendors that closed after April 1, 1988. Some of the wells that provide Vermillion with drinking water are located a short distance from the two abandoned tanks removed by Knodel, a contractor from Freeman, Tuesday afternoon. The U.S. Environmental Protection Agency estimates there are over 30,000 leaks and spills in the nation annually. One gallon of gasoline has the potential to render one million gallons of water undrinkable. Leaks from abandoned tanks can also contaminate soil around the tanks and cause unhealthy gasoline vapors to seep into basements of private homes and businesses. Since these tanks are buried under several feel of soil, these problems can go unnoticed for years, according to the DENR. The state agency notes that the longer old tanks remain in the ground, the more corroded they become. Eventually, they will be safety hazard for people living and working in the area. As the tanks become more corroded, there is an increased risk of the tank collapsing. People who qualify for the program needn’t worry about bearing the burden of the cost of having a contractor like Knodel dig up an abandoned tank. State government will pick up the tab. The program is funded by the South Dakota Petroleum Release Compensation Fund (PRCF). This is a fund created in part to address environmental problems associated with spills from tanks containing petroleum products. The money comes from a fee imposed on each gallon of gas sold in South Dakota. The second fund is the federal Leaking Underground Storage Tank (LUST) Trust Fund. This is money from the federal government that states can use to clean up abandoned tanks.